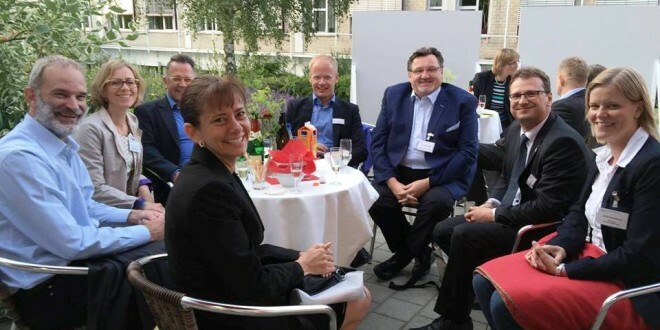 JU's Prof. Roberta Christopher with CNOs, physicians, CEOs and the head of the German Nurses Association, discussing best practices and how to move Germany toward Magnet Recognition and 80 percent BSN by 2020. More than 200 top healthcare professionals from across Germany gained key insight from the School of Nursing’s Prof. Roberta Christopher into what it takes to deliver nursing care at the highest levels of expertise worldwide. 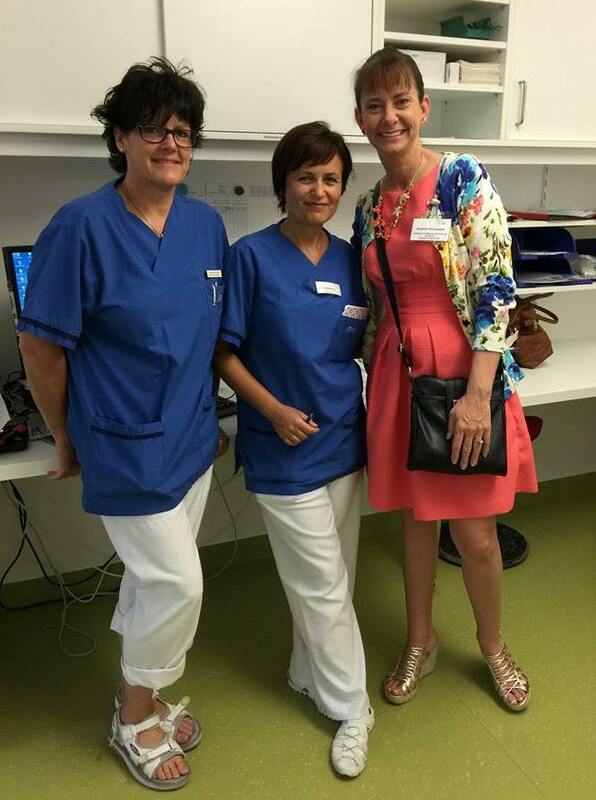 Prof. Roberta Christopher, right, makes rounds at the RKU hospital in Ulm, Germany. Christopher, an Assistant Professor of Nursing in the Brooks Rehabilitation College of Healthcare Sciences, spoke to Chief Nursing Officers, Senior Executives and nurses this summer at the first Healthcare Management Congress in Ulm, giving a well-received keynote titled “Excellence in Nursing. It’s Not an Event, it’s a Journey” on how medical facilities can gain coveted Magnet Recognition from the American Nurses Credentialing Center (ANCC). She used one local hospital’s journey as an example of how improving leadership, advocacy efforts, professional practice, knowledge, innovation and empirical measurement of outcomes can lead to the designation. The goal of the two-day Congress in July was to share best practices and explore how German hospitals can aspire to Magnet Recognition. Christopher shared the benefits of continuing education, such as the Bachelor of Science in Nursing degree and the Doctor of Nursing Practice at Jacksonville University. She gave details of the School of Nursing’s RN to BSN online program, a method of instruction delivery that is not widespread in Germany, as an example of how the country can make BSN education more attainable for working nurses. This was of particular interest to the CNOs, who reported their rate of BSNs working in hospitals is less than 10 percent. They aspire to reach the goal set by the Institute of Medicine of 80 percent BSN by 2020. Christopher’s presentation and attendance attracted national interest, and she was featured on Germany’s weekly health segment via RegioTV (see http://www.regio-tv.de/video/375719.html). Later, she toured the RKU-University and Rehabilitation Clinic in Ulm, speaking with nurses about the benefits of a BSN education and teaching nurse leaders how to systematically round (visit) staff and patients to better gauge outcomes.